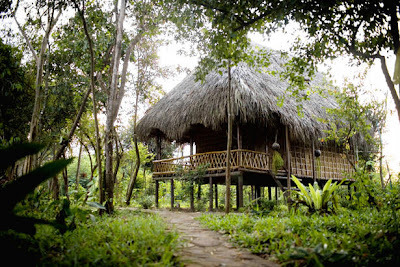 Accommodations in Chi Phat range from thatched-roof bamboo huts to elaborate tents. 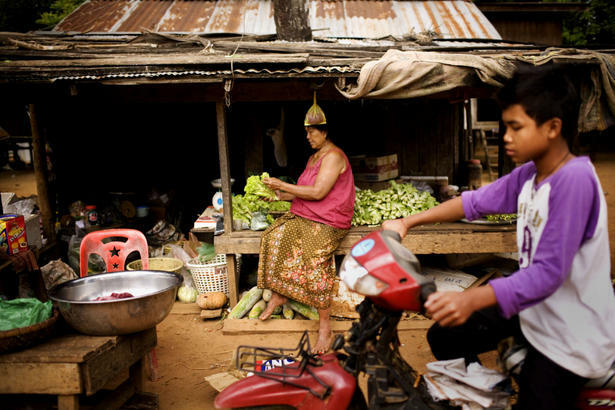 The charms of Cambodian rural life are readily apparent in Chi Phat, home to about 2,500 people. CHI PHAT, CAMBODIA—Inside a breezy bamboo structure in this village in the remote province of Koh Kong, near the Thai border in southwestern Cambodia, a dozen or so foreigners sat for a communal dinner of chicken curry and Angkor Beer. Cinnamon-hued cattle and elderly women wearing ikat sarongs and checkered scarves ambled along the dusty road outside. Eating by the light given off by fishing cages doubling as lamps, the group recounted the day’s activities: birdwatching at sunrise, mountain biking across rocky streams, swimming in waterfalls. And fending off rainforest leeches. “The bite is no worse than a large mosquito,” said David Lambert, a strapping Englishman. Katrin van Camp, from Belgium, had returned from a guided overnight jungle trek, then spent the afternoon in a hammock and playing with local children eager to improve their English. “When I go home, this is the Cambodia I’m going to remember,” she said. For decades, Koh Kong villages like Chi Phat had little contact with the outside world. Marginalized by a lack of infrastructure, a Khmer Rouge presence that endured into the late 1990s and some of Southeast Asia’s wildest, least-explored terrain, the region remained virtually forbidden to outsiders. But new roads penetrate the jungle and scale the hills; new bridges traverse the area’s numerous rivers. And as Cambodia has achieved a level of political stability, a small but diverse array of Western-run accommodations — including the makeshift restaurant in Chi Phat, part of a project called Community-Based Ecotourism — has opened in the last few years, catering to both backpackers and the well-heeled. Thanks to this new accessibility, travellers are now discovering the area’s awe-inspiring biodiversity, which includes one of Southeast Asia’s largest tracts of virgin rainforest; some 60 threatened species, including the endangered Asian elephants, tigers, Siamese crocodiles and pileated gibbons; and a virtually untouched 12-island archipelago in the Gulf of Thailand, with sand beaches and crystal-clear aquamarine waters. The Koh Kong region spans 4,300 square miles, about the size of the Everglades National Park. 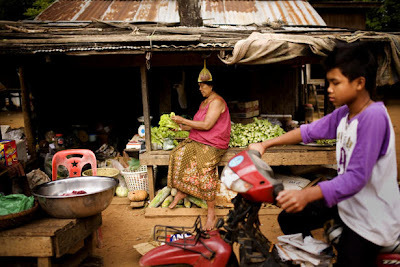 But the charms of Cambodian rural life are readily apparent in Chi Phat, home to about 2,500 people. The village sits at the foot of the Southern Cardamom Mountains, about 16 kilometres inland, up the mangrove- and bamboo-lined Preak Piphot River. Wooden houses on stilts, painted mint green and baby blue and shaded by towering palms, line the main dirt road. Children wearing navy blue and white uniforms and broad smiles cycle to school on adult-size bikes, passing by toothpick-legged white egrets hanging out on the backs of water buffalo in neon green rice fields. It wasn’t always this peaceful. Chi Phat was once infamous for its abundant poachers, loggers and slash-and-burn farmers, who were forced to turn to illegal practices to make a living. That began to change in 2007, when the conservation group Wildlife Alliance started to work with the community on a project that would turn hunters — who knew the forest’s hidden gems better than anyone — into tour guides, and local families into guest house owners. Travellers, meanwhile, can leave the pressures of the developed world behind. Days begin with the rooster’s crow and end when the village’s generator goes silent at midnight. On trips organized by the Community-Based Ecotourism office, visitors can trek through fields filled with canary yellow and electric blue butterflies to reach bat caves hidden behind curved waterfalls, or plant a tree at a reforestation nursery. Recent visitors reportedly caught a glimpse of a few of the area’s roughly 175 endangered elephants. Janet Newman, originally from England, fell for Koh Kong while documenting the province’s wildlife in 2005. Within three years, she had decided to stay for good, and opened the eco-friendly Rainbow Lodge. The lodge, on 12 acres along the Tatai River about 50 miles northwest of Chi Phat, is thick with palms and brightly coloured flowering bushes. The seven wooden thatched-roof bungalows have hammock-strung terraces that overlook the trees. Guests at the lodge — who recently ranged from a young Australian family of five to adventure-ready couples from Europe — can kayak to the nearby Tatai waterfall, a wide expanse that creates small bathing pools and pummeling massage spots between black rocks; head into the jungle on guided hikes, spotting and identifying birds and insects as they go; or just lounge in the wicker sofas in the open-air restaurant, whose thatched roof features a nightly display by limb-size polka-dotted geckos. If you are lucky, the spot might just live up to its name: three rainbows streaked the sky during a November visit. Newman and her boyfriend and co-manager, Gee Cartier, go to great lengths to minimize the property’s environmental impact, sourcing about 95 per cent of Rainbow Lodge’s power from solar panels and supporting Cambodian-made products like biodegradable handmade soaps and locally harvested honey. Cosy as Rainbow might be, some travellers may prefer the creature comforts available at 4 Rivers Floating Lodge, which opened in November 2009 five kilometres downstream on a bend in the river. Bringing luxury to the untamed wilderness is the focus here, with 12 rooms housed in elaborately built tents that float on interconnected decks made of recycled wood. With perks like king beds, air-conditioning, hot water and three-course dinners, 4 Rivers caters to European honeymooners and expatriates in Phnom Penh seeking a refuge from the city. But just as ecotourism is taking off, businesses may soon have to deal with major threats from a different sort of development. Like much of Cambodia, Koh Kong faces serious challenges as the government sells off land, including parcels of national parks, to private developers. Several Chinese-built dams have been proposed or are under construction along Koh Kong’s rivers. And given the recent government approval to build a titanium mine nearby, Chi Phat itself faces the possible loss of 11,000 acres of rainforest and additional challenges to its ecotourism efforts. Last year, ground was broken on a $5-billion, 25-year Chinese-financed tourism project that includes an airport, a sea port, a golf course and a large commercial development along a stretch of Koh Kong’s southern coast, now accessible only by boat. Although the roads and airport might be good for the ecotourism efforts, the additional developments might not. The archipelago consists of a dozen islands with few inhabitants, aside from the main fishing island of Koh Sdach. A few places to stay already operate on the islands. December 2009 saw the opening of hippie-friendly Nomads Land on Koh Totang, a rugged island, and Belinda Beach Resort, opened in October on Koh Sdach, which easily qualifies as Koh Kong’s fanciest digs, with stone bungalows surrounded by bougainvilleas and plumeria trees, an infinity pool and a terrace. As in Chi Phat, positive, symbiotic relationships between businesses and residents are forming on the islands — which may be a bulwark against overdevelopment. Nomads and Belinda Beach employ islanders at their properties; tourists hire fishermen, intimately familiar with the area’s secret beaches and best swimming spots, as day-trip guides. Koh Sdach is best reached by a two-hour ferry ($25) from Sihanoukville that runs every other day (returning the next day); a Chinese-built road is expected to be finished this year. There are currently 11 guest houses and 8 homestays in Chi Phat (855-92-720-925; ecoadventurecambodia.com). Accommodations are simple: foam mattress, mosquito net, shared toilets. You might have a farm animal or two under your room. Take it all in stride. Daily rates are $3 to $5 a person. The seven bungalows at family-friendly Rainbow Lodge (855-99-744-321; rainbowlodgecambodia.com) feature log-frame beds, a silk bedside lamp, fans and private balconies. Doubles, including all meals, are $65. Rooms at the 4 Rivers Floating Lodge (Tatai River; 855-97-64-34-032; ecolodges.asia) are spacious and furnished with beds and settees made of woven water hyacinth; the private verandas are lovely. Doubles, $139. At Nomads Land (Koh Totang; 855-11-91-61-71; nomadslandcambodia.com), you can stay in anything from a single room made of thatched bamboo to a two-storey bungalow with stunning ocean views. There are plans to introduce yoga and meditation retreats. From $8 per person. Belinda Beach Resort (Koh Sdach; 855-17-517-517; belindabeach.com) is the first luxury hotel to come to the Koh Kong coast. Doubles, $120. Day treks from Chi Phat start at $8, overnight trips into the jungle from $20. At Rainbow Lodge, kayaks are free; full-day treks start at $15. You can charter a basic fisherman’s boat at Koh Sdach for $25 for a long half-day; more comfortable is a day trip snorkeling and kayaking with Koh Kong Divers (855-17-502-784; kohkongdivers.com), which is $40 a person. Dives from $55. Copyright, 2011. All rights reserved by New York Times Syndication Sales Corp. This material may not be published, broadcast or redistributed in any manner. Hi there, just was aware of your blog through Google, and located that it's really informative. I'm going to watch out for brussels. I'll appreciate in the event you proceed this in future.